I would have to be as crazy as Deadpool to even consider taking down The Punisher, a dangerous vigilante who’s armed with big guns and explosives. Even the Howling Commandos, the special ops unit with secret orders to take him down, couldn’t do it. In case you don’t already know, Frank Castle, aka The Punisher, was a Marine, husband and father. When his family was killed by accident, during a mob hit, he became a bitter and fierce vigilante. I had to set my comic book reading aside for a minute a few months ago. Unfortunately, The Punisher was one of the comics I was reading every month. However I started back reading it at issue #13, when I read a tweet about the Howling Commandos taking Frank Castle’s only remaining relative and her family, as hostage. Well, knowing how violent and aggressive skullguy can get, I had no choice but to jump back on. I can briefly tell you what I know since I jumped back on to one of my favorite Marvel comic book titles. 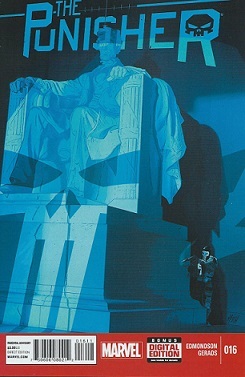 Punisher had plans to rid Los Angeles of Dos Soles, a dangerous and powerful gang. The Howling Commandos intercepted and captured him. Punisher became suspicious of who was giving the elite combat unit their orders and why. He was able to convince the team leader to release him so that he could find the truth behind the madness. In the current issue, skullguy makes his way to Washington to find the perpetrator that put the hit out on him. When Punisher confronts the perpetrator, he not only gets his questions answered, he also learns that he’s not working alone. 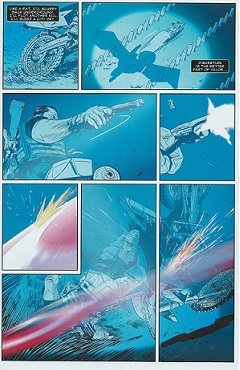 Punisher is eventually spotted and makes a run for it, but his escape gets halted by a prominent figure. I try not to give spoilers, but I can’t help but to give one when I discuss the art. Nathan Edmondson is the creative writer of this mature, action-packed title. Very intense scripting. Fast-paced, but not difficult to follow. Strong, solid characters with sharp dialogue. Lots of aggression, violence, and political corruption. Impressive artwork by Mitch Gerads. Fine details. Great action scenes. Realistic looking characters, especially the man of the hour, The Punisher. Panels are dark and violent, yet surprising. Earlier I stated that I try not to give spoilers. Well I can’t help it this time. Below is Gerads introduction of the character that Punisher will face-off with in the next issue. I like what Gerads did there. I love a badass, which is why Punisher is one of my boyfriends in the Marvel Universe. He’s strong, aggressive, extremely dangerous, and has a body that would make a lot of men here on Earth jealous. There is no doubt that I will continue to read The Punisher. I am aware that Marvel is about to start playing with the emotions of its’ comic book fans with the Secret Wars crossover. I have not had the time to read into the event as much as I’d like to, so at this time I’m not sure what the fate of this series will be. The Punisher #16 was released March 18, 2015. I strongly recommend The Punisher. This issue gets 5/5 stars.